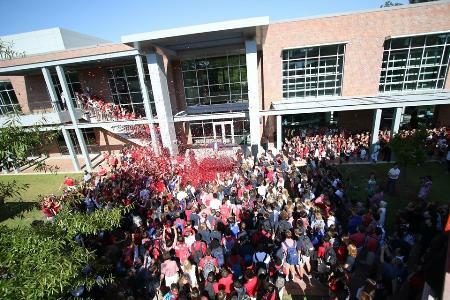 CapDev campaign client, Hammond School, a Pre-K - 12th grade independent school in Columbia SC, welcomed students to the 2018-19 academic year with its brand new Innovation Center. Designed for structured learning and student collaboration and intended to inspire students of all ages, the 30,000 square foot facility is a home for science and technology-related disciplines and in all areas of academic life at the school. The Innovation Center represents the culmination of a process where Hammond leadership and administrators, recognizing the need for emphasis on science and technology, worked with Hammond faculty and students to discern their needs and wishes for new classrooms, lab spaces and technology. With those needs in mind, administrators worked with renowned architects, designers and leaders in education to bring to life a space that is high-tech and highly functional. The Innovation Center is also inspiring and adaptive to ensure that these spaces can change over time as technology changes. The result of these efforts means that the Innovation Center's unique qualities and capabilities give Hammond students unrivaled access to tools for learning. "The Innovation Center synthesizes research gleaned from schools and university settings around the country about their science and technology centers, with the needs of our talented teaching staff and the needs of our students," said Chris Angel, headmaster of Hammond School. "The building offers the latest tools for educating our students in the all-important science, technology, engineering and math studies, but it's also an adaptable space with room for growth and addition of new tools to help our students excel in these areas." In a rapidly changing world, Hammond believes its job is to make sure its students are well prepared for what the future holds. With that goal in mind, the Innovation Center inspires curiosity and provides students unique opportunities to collaborate and explore. Hammond School embraces a future-focused philosophy. The school is committed to instilling in students academic excellence, harnessing the power of curiosity, and helping develop empathetic and global leaders through a well-rounded curriculum. With that goal in mind, the Innovation Center inspires curiosity and uniquely gives students opportunities to explore and collaborate. Additional news available from the Cola Daily and BizWire, and further detail at Hammond's website.